(I’ve had trouble getting online for the last few weeks. The following posts were all written up as word docs, and I’ll post them in the order I wrote them). Palm-fringed beaches (including Dollar Beach – so-named because in the early days of the UN it was one of the favourite day-out-of-town beaches for the UN workers and locals would throng there asking for ‘one dollar mister’). Rice paddies (complete with little huts on stilts dotted about them, where the young guys sit whose job it is to be ‘scarecrows’ – when they see a bird approach the rice they have to wave a scary contraption at them made from Coke cans. The noise and gesture frightens away the birds, but my driver and I wondered how on earth one makes sure one doesn’t go to sleep sitting in the hot little hut day in, day out. 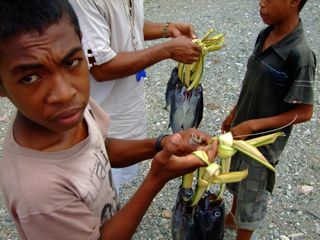 Young roadside fish sellers (Alto, my driver, stopped and bought some – 10 fish for $8 – then put them in the eski he had brought along and in the next village bought ice). Twisting roads, dramatic mountains and cliffs, and some alarming examples of deterioration on the roads, including one point where potholes on either side had extended so that the space in between was narrower than the width of most cars. It’s not a drive where you can just chill out and enjoy the scenery. Unless of course, you are the passenger. 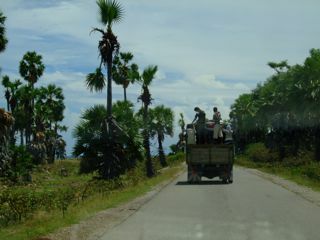 All of those coconut palms and mango trees get thicker and lusher until eventually you arrive in Baucau. Baucau is incredibly pretty. It is set on a hill, very rocky, so that roads are steep and houses are set into the sides of cliffs with rocky overhangs above them. It is a Portuguese town, architecturally, and in the lower Old Town there are many colourful houses and buildings. From the verandah of Mana Lorensa’s house (where I am staying) I have a view across the lower town with the old Portuguese market place in centre view. I love the old market. It has an open courtyard area in its centre, bordered by covered corridors, which presumably once held individual stalls and shops. The back of the market is at street level, but because the land slopes away the old entrance is approached by staircases. These days it needs restoration and there are many bushes that are threatening to overwhelm its approach from the street. Baucau reminds me of Mostar in many ways. Mostar is also hilly, with dwellings built into rocky outcrops. Mostar is also incredibly pretty and I can imagine that Baucau would have similar draw for tourists as Mostar has. 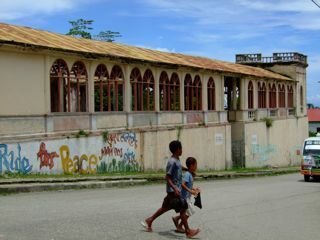 If some of the old buildings were restored, it would be a lovely place to come as a tourist or a Dili-based worker for a weekend. Wander the picturesque town, visit the old market, head to the beaches (which I haven’t seen yet but are apparently stunning), eat a meal in the town, hit the beaches again the next day… There is also a municipal pool here, which is fed by fresh water from the natural springs. Sadly there is no water in it at the moment – it seems like the natural springs are just bursting out onto the road above the pool in a kind of waterfall, and running off down the hill along the sides of the road. The swimming pool is surrounded by palms and little shelter huts, and thick spongy grass – it would be very idyllic place to hang out on a hot day. 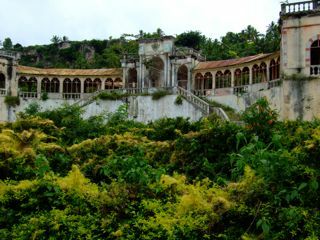 In fact, like Mostar, Baucau is blessed with abundant water. There are natural springs spouting out all over the place. Literally – in the grounds of one school I went to, you can clearly see that the large puddle at the bottom of the steps has been created by an underground spring pushing water up to the surface. The people do not seem as friendly as in Dili. 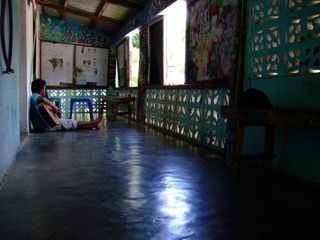 It’s not that they are unused to malae, Mana Lorensa tells me, but just a characteristic of the people here. Their faces break less easily into smiles or greetings in response to the same from me. Rather, they just continue staring at me, or mutter their responding greeting to me, as they look away. But that’s perhaps a bit like Mostar (in comparison to Sarajevo) too! I am only here for a few days before moving on to Lospalos. I have a few things to do – meetings with local representatives of the Ministry of Culture, and spending some time with Marqy at Arte Moris Afalyca, a local free art school doing some very impressive work with young people and providing opportunities for local artists to make work and undertake commissioned work. When I arrived on Friday afternoon I wandered over to Arte Moris Afalyca to say hello and check out their space and ending up playing drums with some of the guys for about an hour. They are great drummers! We need more time to talk, but there are ideas for projects that we could do here taking shape in my head. When I met Marqy in Dili I showed him the videos I downloaded from the brilliant Ping! website for making instruments from plastic containers and plastic bottles and he liked the idea of doing a project involving both instrument-making and performance. Mana Lorensa has suggested putting something together for Human Rights day in December. Perhaps we could do a project in the old market place? Tiny will be here by that time too, so we could bring him and his playing into the project too. So there are a few ideas to explore over the next couple of days. Oh it is stunning – all lush and green with raw rock faces jutting out. But I am also fascinated by the way the landscape of the New Town section is completely different – get to the top of the rocky cliff face and and it is much barer – short scrubby trees, lots of grasses, crumbling rocky ground.